Nintendo has fallen on some hard times over the last few years, especially due to low sales figures on the Wii U, but around 2016, things started to turn around. 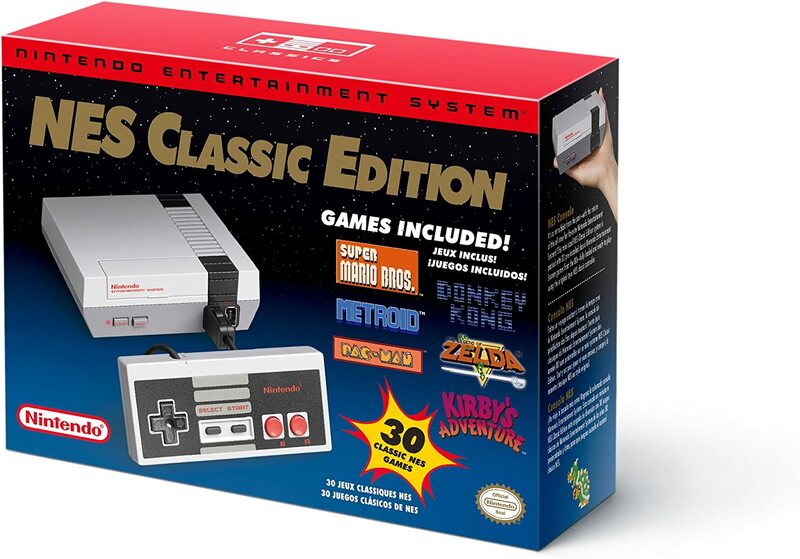 They released a plug-and-play type console, the NES Classic Edition, preloaded with thirty NES hits. It was a major success, local stores did raffles (as Nintendo only sent a small number to each store, but more on that later.) Essentially, the console was an emulator – which has become a popular way of playing retro hits without exactly needing the original console. It seems that retro gaming is coming back, be it downloadable classic games on Steam or other online marketplaces, or even arcades being opened with the famous cabinets and pinball machines. But in today's world of gaming, where you can free roam fantasy worlds and play online with people all around the world, why would people want to go back to the basics? The NES Classic Edition was far from the first remake of a famous video game console. Atari and Sega both have made remakes of the 2600 and the Genesis, though those are pretty affordable and are pretty easy to find, compared to the NES Classic. And as I stated, emulation is a popular system online – you can download a program for Super Nintendo, N64, Dreamcast, PlayStation, you name it – if it's a console, there's either an emulator for it or one in development. Because of the easy access to such programs, and the availability of ROMs (games unofficially ported for use in emulators), many have worked to make “ROM hacks” of iconic games, such as the infamous Kaizo Mario, thus bringing new life into the games many played as children. The Retron console line is an affordable remake of the NES, Super Nintendo, and Genesis all in one single machine, providing high-end emulation for all three consoles and a cheap way of replaying your classic game library you found in the attic. You can go right online and, for free, spend a few hours reliving rainy afternoons playing Nintendo. The actual companies usually turn a blind eye to emulation, often producing ones of their own to compete with the market – but at the same time, they are aware if someone buys an original Dreamcast at their local video game store, the store gets the money, so it doesn't matter if they're getting it for free or not. Arcades have made a comeback as well, not unlike vinyl records and cassette tapes. Movie theaters and department stores often keep a few games set up, mostly your racing and shoot-em-ups so when you're waiting for the movie to start, they can get a few more dollars in quarters out of you, but if you look hard enough, you can find classic style arcades. For example, I used to go to a roller skate rink before it went downhill fast – and they had several arcade cabinets, including a obvious Doom clone and the original Marvel vs. Capcom. I'd be lying if I said I played more of that than I did on the rink. And now, in 2018, another arcade opened up in Maine, this one in Augusta – and they have it all, from Mrs. Pac-Man to a very recent Batman game with HD graphics - which means companies still produce arcade cabinet games. Yeah, kids show up, but you know the parents also go and have a good time because they remember these from their youth, thus allowing the generations to come together under a single roof to play some video games and set a quarter on the machine. And like vinyl, it seems like a small market – but usually arcades are near other places like stores, so now you have a place to either drop off your kid or you can relax after a shopping trip. Add in that shows like Stranger Things are popular with a younger crowd, and the show involves things from the 1980s like arcades, Dungeons and Dragons, and classic rock – now kids want to go to a similar place and play the same games. However, while those have contributed to the retro revival, it really boils down to nostalgia for the 1980s and 90s kicking in. From movie adaptations of Transformers and tributes like the previously mentioned Stranger Things, the children of the 80s have grown up, but never lost the nostalgia for the past, which is true for all generations. These kids now have kids of their own, and while those children may be able to play great games like Halo and BioShock, the parents remember a time where Nintendo ruled the roost – and in the case of Nintendo, game series like Mario, The Legend of Zelda, Metroid, and Pokemon have continued to produce new games and new content regularly, thus allowing today's youth to have “their Zelda” and another group of Pokemon that they can name, but 90s kids can't keep up with (the Kanto region, oh yeah I can name them off). Nostalgia comes to every generation, but with the millennials, they have the ability to go online and get aspects of their childhood, still in relative high definition. Everybody has that thing that reminds them of the “good old days,” whether it's music or TV shows or even a teapot, we all get nostalgic for something. And with the current group of young adults, they grew up with the rise of video games, hence why now we're seeing an 80s revival. From It being moved to take place in 1989, to re-releases of classic video game consoles, to 80s pop getting airplay on radio again, peak nostalgia has come into play. You can drive half an hour and play a few games at the arcade, you can play Super Mario Bros and Sonic the Hedgehog on your home computer without any issue (there's even controllers you can buy for them). In time, we'll see a revival of things we grew up with, like the Gamecube and Windows 95 games. For now, we're able to practically go back in time and play out the games that made the industry what it is today. Retro gaming is in its peak, and it's not going anywhere anytime soon.